We believe that children, their families and society all benefit from a high quality experience in the child’s early years; and there is a critical link between their childhood experiences and later successes in life. Our teachers encourage the children to develop their individual interests and strengths through the purposeful utilization of diverse materials, experiences and environments. We strive to integrate families and the community into our activities to fully engage all facets of childhood learning. 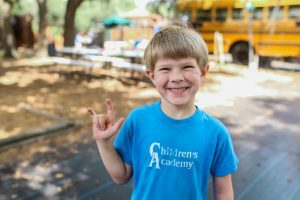 Children’s Academy is committed to providing a safe, nurturing environment where the children’s potential can be fully realized. We achieve this by fulfilling not only the child’s basic needs, but also offering them the gifts of respect, acceptance and love. Built On The Foundation Of Family! CALL US TODAY at (813) 689-6820 or Contact Us Online To Get Started!